The verdict on the DEWALT DWE7490X 10-Inch Job Site Table Saw with Scissor Stand is a resounding yes and falls within the budget of enthusiasts and professional woodworkers alike. The versatility and sheer power of this jobsite table saw are hard to find which also includes a scissor stand which makes it possible to setup anywhere you choose. DeWalt is one of the few manufacturers out there who has a true understanding of what users look for in a power tool. Meeting the needs and requirements of both enthusiasts and professional users alike have helped make them one of the most celebrated names in the business. This consumer confidence shines with DeWalt’s lineup of table saws which is with durable construction on and off the jobsite. 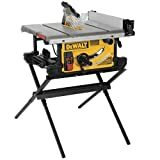 One such tool is the DEWALT DWE7490X 10-Inch Job Site Table Saw with Scissor Stand which is a compact model which can be setup anywhere, any time. This versatile table saw comes complete with a scissor stand which offers more versatility than most. Complete with a 10-inch carbide blade, folding scissor stand, push stick and miter gauge, this kit is the all-in-one solution for contractors and enthusiasts alike. The DEWALT DWE7490X 10-Inch Job Site Table Saw which includes a scissor stand offers a great depth of cut at 90 and 45-degrees. Fence adjustments are quick, smooth, and simple to make thanks to the pinion telescoping fence rails while giving users improved accuracy over most. Narrow and larger rip cuts can be seen with a rip capacity of 28-inches. For a compact jobsite table saw, there’s much more power onboard than you would think. Powered by a 15-amp motor which is more than enough to cut through the toughest of hardwoods and lumber. Simplifying different operations, users will come to appreciate tool-less adjustments with the Site-Pro Modular Guarding System. DeWalt has done a great job putting their warranty where their mouth is as they offer a 3-year warranty on most of their higher end power tools. The DEWALT 10-Inch Job Site Table Saw is no different as it gives users 3-years piece of mind from manufacturer defects and problems with the most expensive parts. This gives you worry free use for years which is 2-years more than most manufacturers which typically offer a 1-year warranty. This is huge considering it protects your investment for rigorous use on any jobsite. This is something to consider, especially if you plan on using it regularly for installing cabinets, installing hardwood flooring, building decks, remodeling, and any other specialized, woodworking tasks.